The field in front of the gate has been terraced. To reach the cemetery in an ordinary car, follow the road south to the house. Turn east and continue following the road to the field behind the house. In the field, turn north and follow the treeline to its end. The cemetery will be at the end of the treeline. A high clearance vehicle can drive straight across the field from the gate about 100 yards to the edge of the treeline and the cemetery. This cemetery has one known grave. It is fenced with an old-fashioned wire fence. The enclosed area is big enough for about 6 graves and has 4 trees. Branches and debris inside the fence make it impossible to tell if there are any additional graves. There is a foot stone for the headstone. 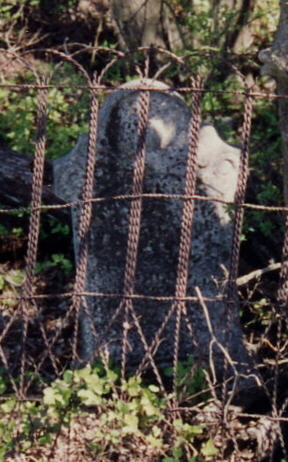 The cemetery is on the John L. Terry survey. One-quarter acre was deeded for a cemetery in Vol 310, p 483, in 1937. It was again set aside in 1989. The fenced area does not cover that much land. The cemetery is near the top of a hill. There is an open field on three sides and a woods on the south. The land drops sharply at the woods. At times the field is used for cattle. 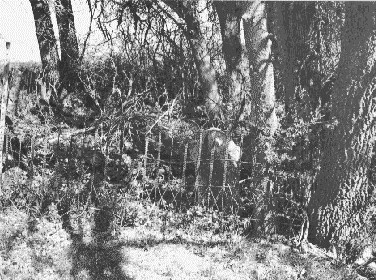 There is no evidence that the cattle have been in the cemetery. From the cemetery you can see Van Alstyne and Anna in the distance. The Burks may still own the land. It is leased by Rick Thompson, who has a key to the gate.